With the Moon in dreamy Pisces and Venus entering Aquarius there is a lot of emotional cardinal energy floating around, its somewhat very airy fairy. 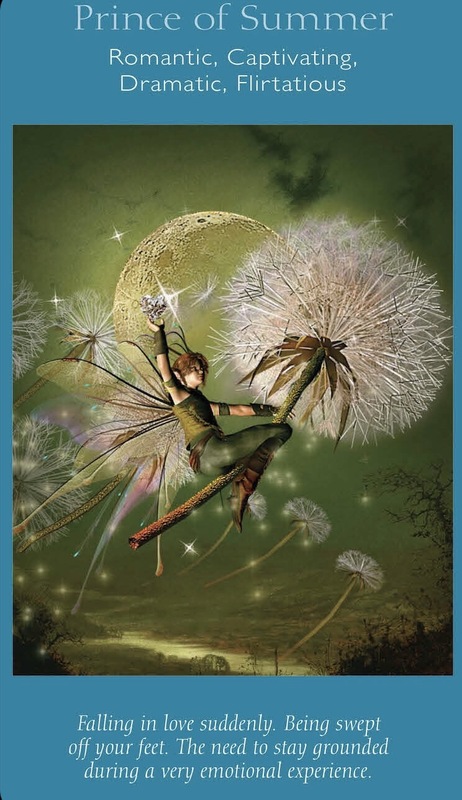 With that i thought pulling a card from Doreen virtues Fairy Tarot deck. Today’s card is The Prince of Summer. This charmer may be a Prince, but he is truly the king of romance! Utterly in love with love, he can zoom in and have your heart fluttering in the blink of an eye! He is refined, artistic, and introspective, as well as dreamy and possibly a bit melodramatic. A hopeless flirt, he will read you poetry while looking deep into your eyes. In his heart, he really is generous and quite tender-hearted. His focus is on you and you alone . . . until it isn’t. And therein lies the problem. He is the Prince of Summer—and ooh, you’ll be so happy for a time. Maybe forever! (Maybe . . . ) Just keep in mind that this Prince is known for having a wandering eye. And he likes to spread happiness around. So be very cautious! A person can appear in your life today that makes you fall head over heals with the idea of them, they can give an impression of calmness and serenity. However they are self-contained and can even be secretive. Under that veneer they can often be intense and volatile. They tend to hide their deepest passions, and to protect them fiercely. This card can also indicate an alteration in a person’s behavior, This card comes up to indicate you can you may be happily falling in love.